In honor of that huge geographical electrical outage ten years ago this weekend, here’s a throw back to a Better Investing column I wrote at the time. We rolled into town to find all the traffic lights out of service, with the expected gridlock. A five-minute spin across town turned into a one-hour start-and-stop marathon. It was nearly 100 degrees outside. People really like their air conditioners when the temperature exceeds two digits. In fact, people were liking their air conditioners — a whole lot — from Indiana to Maine. As of a few days later, the cause is yet unknown. We do know that a power plant on the shores of Lake Erie tripped, much like the circuit breakers in your house — removing several hundred megawatts of electricity from the supply. In an instant, power was rerouted along an alternate conduit. As it turned out, the telephone circuits weren’t the only ones that were real busy. The additional power did the same thing that your spouse or teenagers do to a home circuit when they plug a hair dryer, a CD player, the toaster oven and their cell phone recharger into the same outlet. It got hot. Birds and squirrels got hot feet and a really big circuit breaker did exactly what it was supposed to. At the same time, a power plant on the shores of Lake Michigan decided to misbehave. Slumbering gremlins all over this electrical grid decided to hold a party and wreak some havoc. They wreaked well. The power plants in the eastern Midwest could no longer keep up. An automatic appeal from the wires and power plants in Ohio and Michigan requested more power from plants in New York and Maine. Other wires got hot. The gremlins were ecstatic at the amount of trouble they had started. 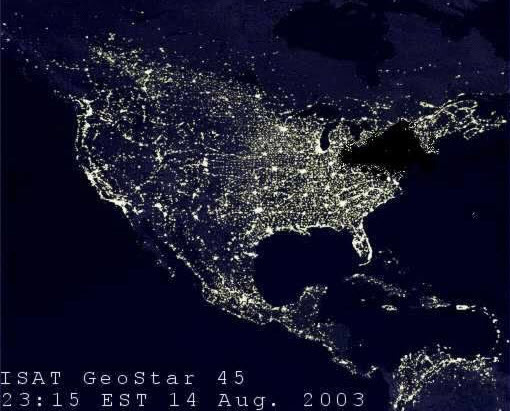 Factories, businesses and residences from Michigan to New York were plunged into darkness. The lower level of our home became an extended campout and the scene of a number of Axis and Allies board game battles. We barbequed nearly everything in the freezer and had a feast. But we had water at the campsite in northern Michigan. We learned that our local water supply is quite dependent on electricity, too. No matter how hard we turned the faucet,we had no water. Living without electricity is a challenge and can even be “cool” for a while. Living without water is not. Please do try this at home. Throw the main breaker. Turn the valve and shut off the water supply to your home. See how long you can last. I believe you’ll pine for the water before the “juice.” You’ll probably be reminded to establish some jugs of water in your basement. We were. Alex was despondent when the lights came back on. We promised each other that we’d leave the television off for one more day. When Internet service returned, I spent some time learning about infrastructure and water supplies. I refreshed my memory about electricity reserve margins and reliability. I’ve added a backup power supply for our local municipal water pumps to my list for Santa. We need to think about whether we have enough power plants and wires. Where will we get tomorrow’s water? The development of electricity, water and waste water projects — at home and abroad — is vital for growth and probably represents opportunity for strategic investors. Alex always defeats me at Axis and Allies when my infrastructure breaks down. Reblogged this on Expecting Alpha.